A fortunate turn of events meant that Cindy and I found ourselves in Tokyo for a week over Easter. While she worked on the Saturday, I caught up with my brother for lunch at Nagi Shokudo in Shibuya. We'd dropped in for dinner on our last trip, but this time I got to sample the lunch menu. It's 1000 yen (~$11) for a lunch set. You choose 3 dishes from a list of 10-15 options and get them served up with a salad, some rice and a bowl of miso soup. I ordered the fried soy meat (bottom right), the dahl fritters (bottom left) and the tomato and ginger tofu (top right). This was an excellent way to get back into the swing of eating in Japan. Set meals at lunch are almost always a cheap and filling option, and this set had the added bonus of a bit of flexibility and excellent execution. The tofu and soy meat in particular were brilliant - really top notch. This is nowhere near Nagi Shokudo, but is Shinjuku Gyoen, where I spent my pre-lunch hours enjoying the cherry blossoms. The place is lovely too - hard to find, but worth the effort. The staff speak a decent amount of English and the menu is translated, which makes life a bit easier for hopeless monolinguists like us. They have an array of zines and CDs for sale as well and seem to be a bit of a meeting point for Tokyo hipsters (the Portland band Sad Horse were lunching there on our visit). Read about our previous visit here. 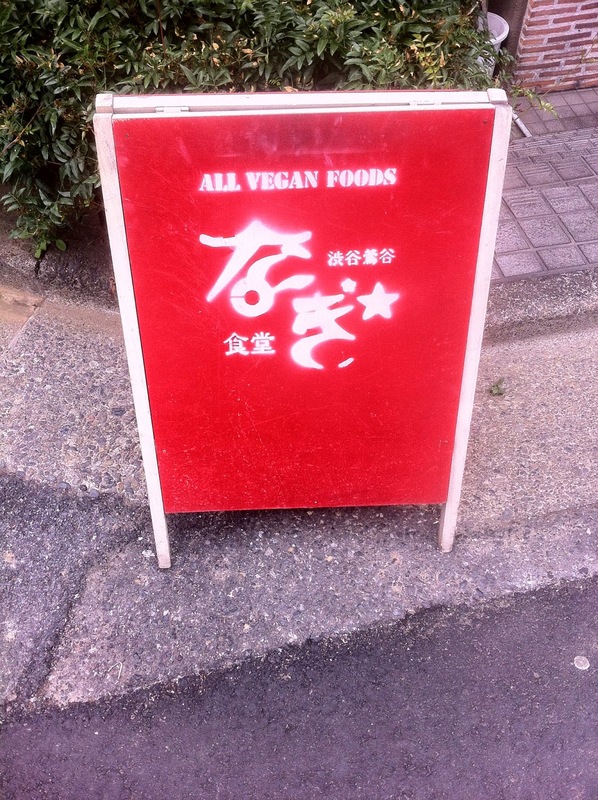 Lots of other bloggers have enjoyed Nagi Shokudo - see Big Tent Vegan, Vegetus, Vegetablian, Cascadian Abroad, Kitty and Buck and JoJo + Japan for positive reviews, while VegOut Tokyo and Bon Voyage Vegan had more mixed feelings. It's on the quiet south-western side of Shibuya station and you'll need to make sure you have good directions/map screen shots. Even when you find the right intersection the place can still be hard to spot - it's hidden low in a little cluster of restaurants - look for this sign. Accessibility: Nagi Shokudo is down a handful of stairs and is pretty crowded inside. There's full table service. We didn't visit the toilets.